Today I'm so excited to share a few (okay maybe a little more than a few haha) photos from Madeline's 2nd birthday party. Up until two months before her birthday, I was planning to have a "Tea for Two" birthday party for her. 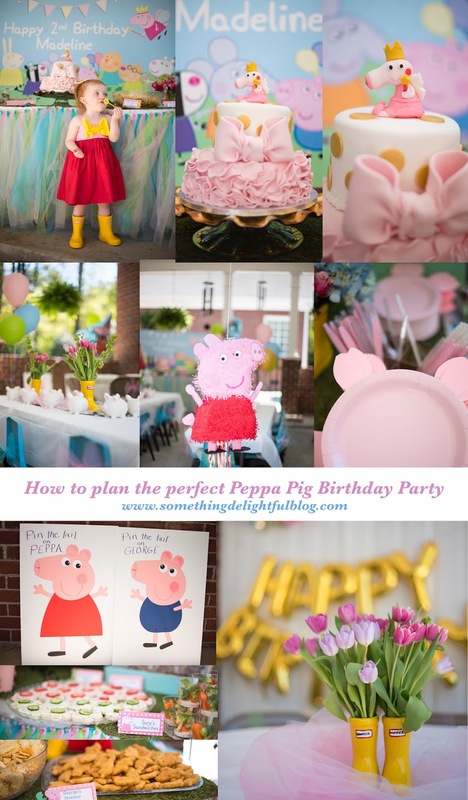 But I happened to see a photo on Pinterest of a Peppa Pig birthday party, and the ideas started flowing from there. Madeline has been obsessed (obsessed is an understatement) with Peppa Pig since the fall of last year, so I knew it was only fitting to plan a Peppa party for her. Peppa is the cutest little show, and I'm not going to lie, I have enjoyed watching it with her haha. She has learned some of the cutest phrases and has shocked me with some of the intellectual skills she has picked up from watching Peppa. She received several Peppa playlets for Christmas, and watching her play and pretend with them has been the cutest thing! "Pin The Tail on Peppa"
"Pin The Tail on George"
Balloons (also this set)...ended up being MUCH cheaper buying them in sets this way. Felt Muddy Puddles: If y'all have been following me on here for a while (or follow me on Snapchat and Instagram to see my stories), y'all know that Madeline loves jumping in puddles...muddy puddles, if she has it her way (thank you, Peppa Pig). When it rains, she immediately reaches for her boots and wants to go jump in puddles. This has caused her to grow a deep love for her rain boots. I saw this on Pinterest and knew that I had to cut out giant muddy puddles for my girl who loves to jump in puddles. I ended up getting a roll of brown felt (15 feet to be exact), and after drawing them out with chalk then cutting out each puddle (roughly 2 feet wide), I was able to get about 12 muddle puddles. Rain Boot Centerpieces: If you watch Peppa, you know that if you want to jump in puddles, you must put on your boots first! Madeline has followed this rule, and loves her yellow rain boots that are just like Peppa's. If she had it her way, she would wear rain boots every single day. I purchased these rain boot planters and painted them just like Madeline's yellow Hunter Boots. The funny thing is that these planters are just about the exact same size as Madeline's actual boots. It took about two coats of yellow gloss spray paint to cover these. Then after drying, I painted the Hunter logo on them, then covered them with a gloss spray paint for extra protection. These looked soooo adorable on the kids tables, the adult tables, the food table...every table! I filled them with hydrangeas, roses and tulips. Piggy Plates: I saw these piggy plates already made but personally did not want to pay that price for them as I knew they would be simple to make. After cutting out one piggy ear, tracing it several times on a piece of construction paper, making a few copies of that paper, laying it over a few sheets of pink construction paper and then cutting out the ears, all I had to do was use a hot glue gun to stick them on the plates. With the help of my sweet mama and brother, we were able to knock these out in about an hour (one person cutting ears and two glueing). We ended up making about 100 (dinner + dessert plates). These were a hit! Tulle Table Skirt: As soon as I purchased the backdrop to go over the food table, I knew that I wanted to create a tulle table skirt for the table. I wanted the colors to coordinate with the banner as well. Tulle table skirts are pretty pricey if you buy them already finished. It took me five hours (broken up over a three day period after I put Madeline to bed at night), but I loved the results! The one I created was 15 feet in length by 3-ish feet in height and it took 28 roles of tulle. I just went to Hobby Lobby and purchased the four colors of tulle I needed when they were 50% off, and it ended up saving a bunch of money. The skirt ended up being beautiful (it looked like sherbet). I was obsessed with the colors. I followed this tutorial as far as tying the tulle goes, but I preferred to tie the tulle to ribbon and hang it on the table with command hooks. I wanted to make sure that there was plenty to keep the kids entertained! I thought the ceramic piggy banks would be a fun activity for them to decorate and take home. They ended up being a hit! 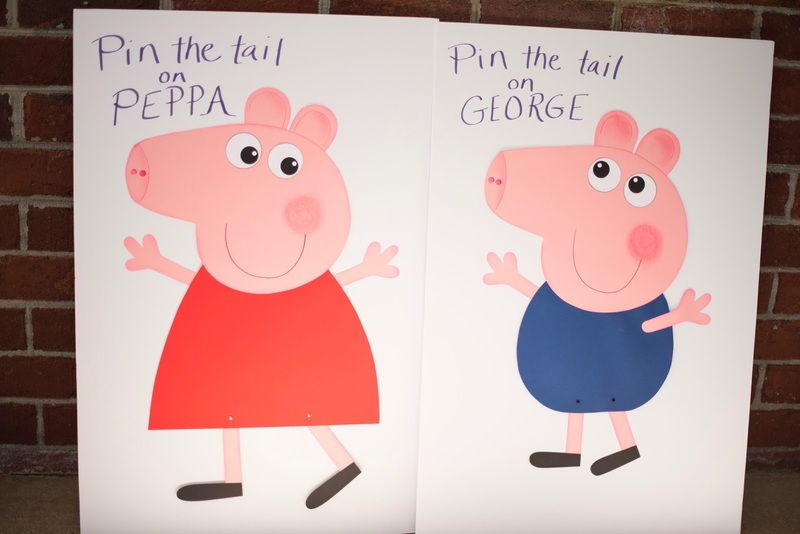 We also had "Pin the tail on Peppa and George." The Peppa Piñata was packed full of treats to take home as well. The biggest hit of all was the jumpy castle we rented for the party. I also purchased these darling Peppa, George and George's Dinosaur cookies (that were also delicious!) for the children to take home, along with some bubbles. 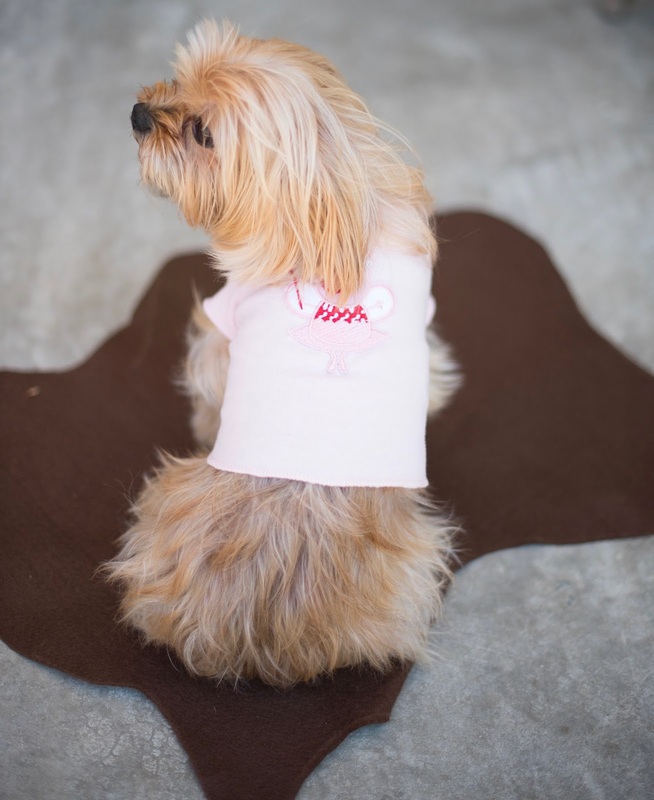 Jaycee Girl even attended the party and joined in on the excitement as we found this little Peppa iron-on patch to iron on to one of her little shirts. I also have to brag on the tassel banners that I purchased for the party. The banners turned out being more perfect than I ever imagined! I received them super fast, and Rose was awesome in helping me personalize them to the EXACT colors I wanted. And just a side note, check out this Lilly Pulitzer inspired tassel banner she has! Sorry for the super long post, but I hope y'all enjoyed it! If you're planning a Peppa party, hopefully this has been helpful. I enjoyed this post very much! You did an amazing job!! All of the details for this party are so cute! My niece is obsessed with Peppa, so I'm definitely sharing this with my sister for her upcoming 3rd birthday! This is probably the cutest thing I have ever seen!!!!! Adorable! Thanks so much for sharing and I love all the details you put into everything. Happy 2nd birthday to you're sweet girl! Madeline's birthday party looks so cute! Love all of the pictures!